I recently read an interesting article in the New York Times about the frenzy of lawn replacements happening in drought stricken California. The article is entitled “Brown is the New Green”. 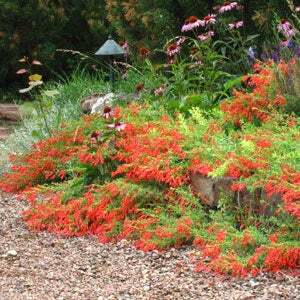 Zauschneria garrettii 'Orange Carpet' is a deer resistant groundcover, perfect for raised beds. But I take serious issue with the concept the article proposes as it shows a real lack of understanding of the value of greenery in our urban / suburban areas. That, and the fact that high water turf lawns can be replaced with native turf grasses and groundcovers that use a fraction of the water and STILL BE GREEN! Let me be clear when I say, there is no need to rip out lawns and replace them with gravel. (“Brown is the New Green”.) When we lose the cooling power of our lawns and landscapes, it intensifies the urban “heat island” effect. The heat increases and we use much more energy to cool our living spaces. The majority of lawns are really just a green place holder. As the high water lawn grasses are removed, there is often considerable collateral damage with the loss of our urban/suburban tree canopy. The trees that have been planted into or on the edges of lawns, often die from lack of water when gravel is spread and the lawn irrigation is abruptly shut off. What a waste to lose all that time growing trees that shade, cool and clean our environment when the lawns are replaced. Use groundcovers instead of gravel! Creeping Gold Buttons (Cotula sp. ‘Tiffendell Gold’) – a South African perennial that HCG introduced back in 2003. It’s deep rooted and the stems root as they spread, rapidly covering the ground with low, tight, bright evergreen foliage. 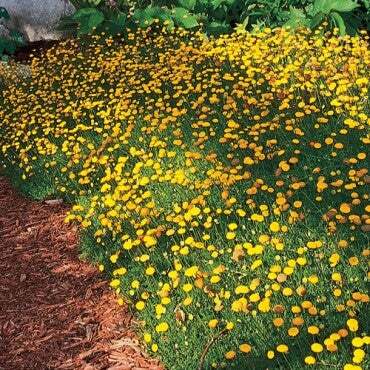 The gold button-like flowers cover the plant in late spring for several months. Tolerates light foot traffic and sun/partial shade. Pink Soapwort (Saponaria ocymoides) – a spreading European wildflower that covers itself with a profusion of bright pink late spring flowers. The semi-evergreen foliage is attractive and deep green. For sun and partial shade areas. Sweet Woodruff (Gallium odoratum) – a shade lover that forms a dense, deep rooted cover of attractive foliage. Blooming in late spring with a haze of small white flowers. Hardy Iceplant (Delosperma species and cultivars)- fast growing and colorful, these evergreen South African groundcovers are just the thing for growing on top of and covering gravel. ‘Blut’ and Delosperma nubiginum are two of my favorites. Turkish Speedwell (Veronica liwanensis) – a stunning spring bloomer that covers itself with bright blue flowers. Best in cooler climates with adequate rain and snow to keep it watered. Carpeting Pincushion Flowers (Pterocephalus depressus) – a slower grower for small spaces, its evergreen foliage tolerates light foot traffic. The large mauve-pink flowers are showy and followed by feathery, ornamental seed heads. Tough and pretty. Best in sun. Creeping Hummingbird Trumpet (Zauschneria garrettii Orange Carpet®) – Plant Select 2001. 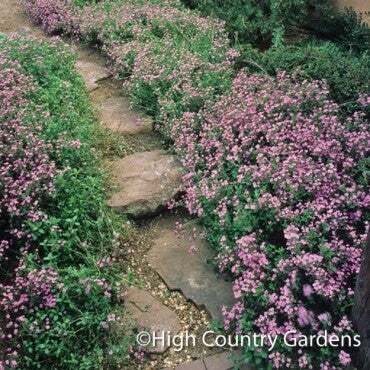 This rapid-growing perennial spreads via underground stolons and forms a bright green carpet of foliage that disappears in late summer under a brushfire of brilliant orange flowers. Sun and partial shade. ‘Gold on Blue’ Prairie Zinnia (Zinnia grandiflora) – Plant Select 2014. A tough, long-lived, drought tolerant native prairie wildflower that spreads by underground stolons that look like a blue-green a shag rug. Blooms in summer with a profusion of golden daisies. Great for slopes. Full, blazing sun. Saponaria ocymoides 'Soapwart' has bright pink late spring flowers and semi-evergreen foliage.